Reference number for this case: 4-Oct-54-Saint-Victoret. Thank you for including this reference number in any correspondence with me regarding this case. Saint-Victoret. -. A 13:80 [sic], whereas he went to his work, Mr. Alfred Capron, accompanied by several people, looking at the evolutions of the normal mail from North Africa, saw with his glance above the pond of Berre, in direction of Roguac, a mysterious craft in the sky. This machine was at approximately 1.500 to 2.000 meters of altitude, having the shape of a pencil pointed at the two ends and appearing at this distance to have a 20 centimeteres in length, with a very strong gleam in its center; it seemed metallic. After hovering for two minutes approximately, the apparatus disappeared very quickly towards the horizon. The date is approximate, as it was not specified in the newspaper. 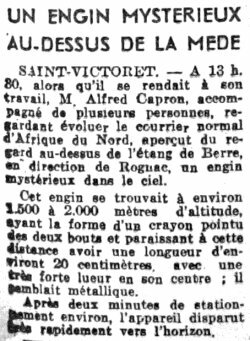 [---] Article in the regional newspaper Le Méridional, France, page 5, October 8, 1954.